In medium bowl, sift together flour and powdered sugar. Cut in chilled butter until mixture is sandy looking. Add egg and yolks, sour cream, lemon juice and lemon peel. Gently mix with fork until just combined. Turn dough onto lightly floured surface and gently knead until dough is smooth. Form into 2 disks, wrap in plastic wrap and refrigerate for about 1 hour. Preheat oil in Presto® electric deep fryer. If using an adjustable thermostat deep fryer, set at 375°. Using only as much flour as necessary, roll one disk out no more than 1/8-inch thick. With a pastry wheel, cut dough into 2- by 4-inch rectangles. Make a 3/4-inch diagonal slit in center. Pull one end through slit and gently pull as far as it will go without tearing. Let sit about 10 minutes before frying. Repeat with second disk. Again let bowties sit about 10 minutes before frying. Fry a few at a time until golden on both sides, turning carefully as needed. Do not overcook. Drain on paper towels. Dust with powdered sugar when cool. Rose Variation: Using fluted or plain biscuit cutters, cut circles of three different sizes. Put the circles one on top of the other, with the smallest on top. Pinch together securely in the middle, forcing the circles to bend upward. Let sit for about 10 minutes before frying. Carefully place in oil. Using a wooden spoon, gently hold under the oil to brown. Drain on paper towels. 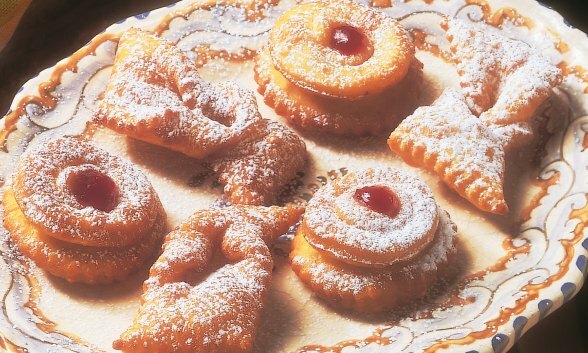 Dust with powdered sugar and place a drop of jam in the center.